For the first time in a number of years I am not going to Campania this year. I will miss being on the Amalfi Coast and visiting Naples but I am making up for it by drinking a lot of wine from Campania. Under the banner of Campania’s Wine Excellence, the region hosted a series of tastings, seminars and dinners earlier this month. I attended a dinner and a seminar and Grand Tasting at Del Posto Restaurant. The seminar was in two parts: the first was a tasting of the white wines of Campania and the second featured the red wines. 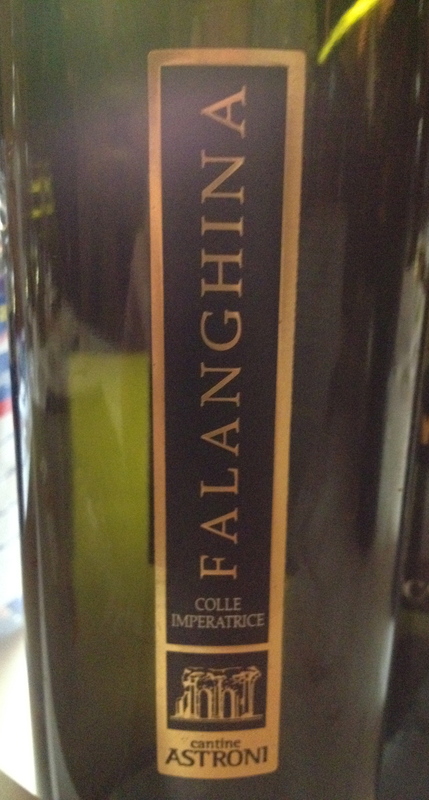 Three of my favorite white grapes were represented: Falanghina, Greco di Tufo and Fiano di D Avelliano. 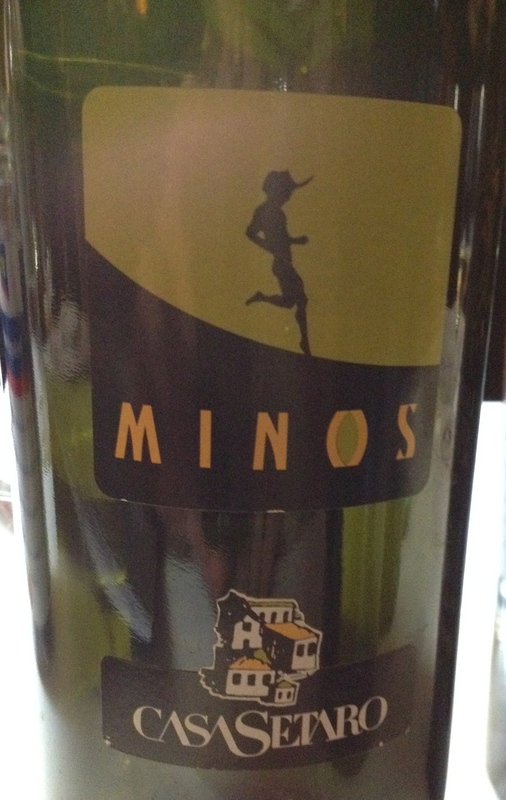 Casa Vinicola Setaro Minos Campania IGT 2012 100% Falanghina. The production area is the Trecase resort town of Bosco del Monaco and Tirone inside the national park of Vesuvius. The soil is of volcanic origin and is rich in potassium and trace elements, loose and sandy. The owner of the winery, Massimo Setaro, was present and said that these vines are not grafted onto American rootstock because phylloxera cannot survive in this soil. The age of the vines is 15 – 25 years and the vineyard is 220 to 305 mts. above sea level. Harvest takes place the second half of October and there are 4000-4500 vines per hectare and the training system is espalier with pruning goyot. The grapes are hand harvested, there is a sorting then a cold maceration in silos insulated to temperature of around 4°C for 48 to 72 hours. The wine is racked and pressing is in a pneumatic press. Clarification of the must and fermentation at a controlled temperature 10 – 12°C. The wine remains on the lees for 3 months. It is straw yellow, with hints of broom and quince combined with mineral tones made it for me a real Falanghina del Vesuvio. On the palate it is fruity and very pleasant with an elegant mineral volcanic character. Cantine degli Astroni Colle Imperatrice Campi Flegrei DOC 2011. 100% Falagina The vineyards are at 200/400 meters and the exposure is southeast. The soil is volcanic ash and clay loam and the training system is guyot. Harvesting is by hand and takes place the first week of October. There is cold maceration and fermentation takes place in stainless steel for two weeks. There is whole berry fermentation, the grapes are not pressed. The wine remains on the lees in stainless steel tanks for a few months. This is a very well balanced wine with floral scents, ripe fruit, a hint of smoke and a touch of honey. The ancient Greeks brought Greco di Tufo grapes into the area around Naples about 2,500 years ago. It may have been one of the grapes used to make Falernian, a wine much prized by the ancient Romans. Greco is a late ripening varietal and the phenolic compounds in the grape contribute to the wine’s characteristically deep color. Greco is best when it is found in the volcanic hills in the Avellino province in central Campania. Only 8 villages can legally claim to make Greco di Tufo. One of these villages is Tufo from which the wine gets it name. Tufo is also the name of the rock on which the village is built. Greco thrives here because there is tufaceous, volcanic soil rich in sulphur and a relatively dry microclimate. The vineyards in this zone are between 400 and 450 meters. According to the DOCG regulations, Greco di Tufo must be at least 85% Greco and 15% Coda di Volpe. Sparkling Greco di Tufo spumante is also produced. 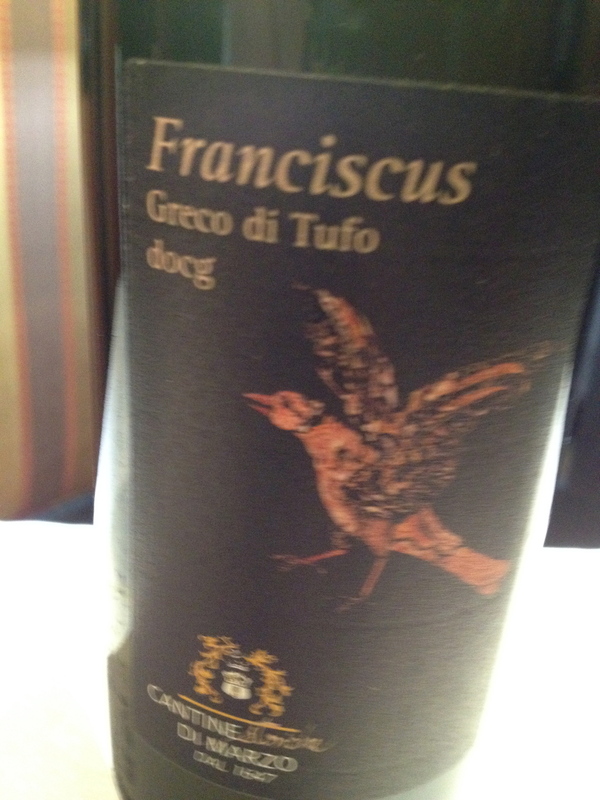 Greco di Tufo can be drunk after 3 years but in the hands of the right producer can last for 20 years or more. Cantina di Marzo Greco di Tufo 100% Greco. I sat with Mr. Somma, the owner of the winery, at the dinner at Del Posto and he said that it was the oldest cantina in Campania and that his ancestor introduced the Greco grape into the zone. The vineyard has a southwest exposure and is at 250 to 500 meters. The age of the vines is 5 to 20 years and the training is guyot. Harvesting is by hand in the middle of October. Lightly pressed must and must run are blended together. Alcoholic and malolactic fermentation takes place in stainless steel tanks. Fining is on the lees. Clarification is by cold and light filtering. The wine has nice citrus aromas and flavors, a hint of orange blossom, minerality, good acidity and a touch of almonds in the aftertaste. La Guardiense Colle di Tillo Sanno 2012 100% Fiano. The harvest is by hand in early October and the wine is fermented in stainless steel tanks for 15 days. The wine has floral hints with a touch of white peach. 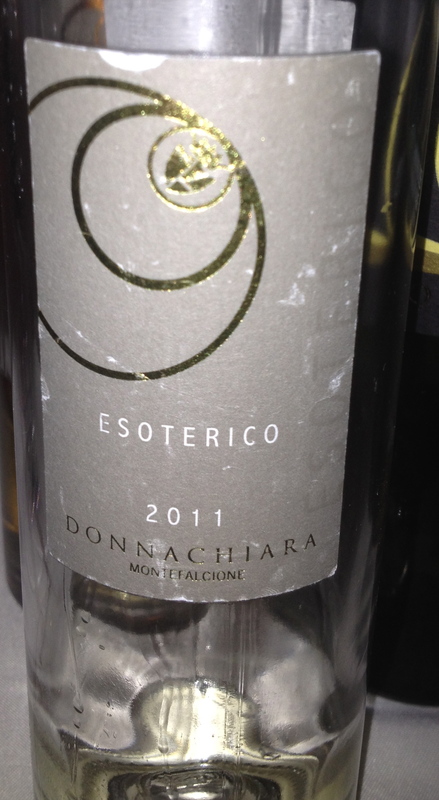 Esoterico Fiano D’Avellino IGT 2011 Donnachiara Made from 100% Fiano from the Montefalcione vineyard. The soil is volcanic, chalky clay, the vines are 6 years old, the training system is guyot and there are 4,400 vines per hectare. The grapes are not destemmed or crushed prior to pressing. The late harvest takes place the first half of November. 20% of the fermentation takes place in French barriques. The wine is naturally clarified and there is no refrigeration or filtration at bottling. This is from a new line of wines. They are almost dessert like and very different form the regular white wines. Fiorduva Furore Bianco Costa D’Amalfi DOC 2011 Marisa Cuomo The wine is made from 30% Fenile, 30% Ginestra and 30% Ripoli. The production zone is in Furore and the surrounding municipalities on the Amalfi coast. The coastal terraces are at 200/500 meters and are south facing. There are 5,000 to 7,000 vines per hectare. The training system is pergola. The soil is limestone-dolomite rocks. Harvesting is by hand the third week of October and the grapes arrive intact in the cantina. After pressing the juice is inoculated with selected yeast. Fermentation takes place for about 3 months in oak barrels at 12°C. 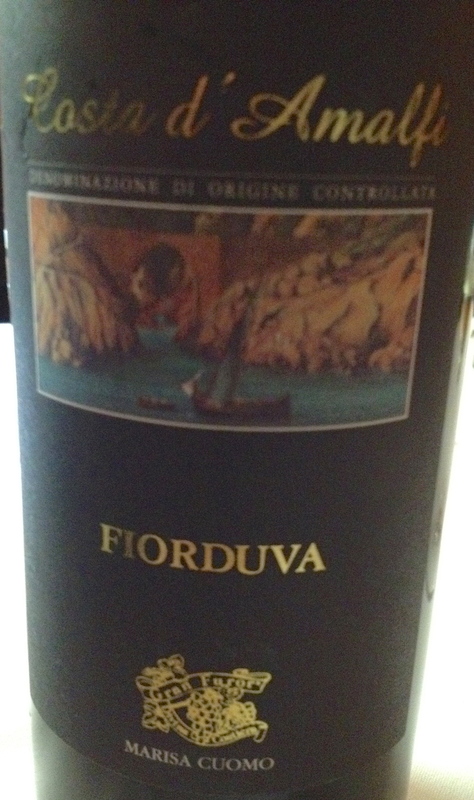 The wine has very nice fruit with hints of apricot, raisins, a touch of candied fruit and good acidity. This was my favorite wine at the tasting.